It has been unseasonably cold the past few days. I’ve been a little under the weather anyways and this dark, chilly day makes me want to take some more NyQuil and go back to bed. I had to go outside to feed the chickens and get the mail, so Ava and I stopped to smell the roses (and pick some strawberries) along the way. Peace Rose with rain drops. Second round of bloom on some hollyhocks. Boldly colored berries on my Varigated Porcelain Berry Vine. Closeup of crimson red stars on my cypress vine. Cypress Vine ate my fence! Christmas Lights ornamental hot peppers. Had to be quick to get a shot of these Ozark Beauties! Last few blooms on my Scarlet Runner Beans. Scarlet Runner Beans amaze me. These gourds volunteered from seed of last year’s store-bought gourds. Tomorrow will mark two years since my husband’s father went to be with Jesus. He was always one to stop and smell the roses and encouraged others to do the same. You can see pictures of some of his famous roses and read the tribute I wrote for him last year here. I hate that my daughter wasn’t old enough to get to know him. He was really an amazing person and more like a father to me than an “in-law”. The camera really doesn’t do justice for the color of this flower. 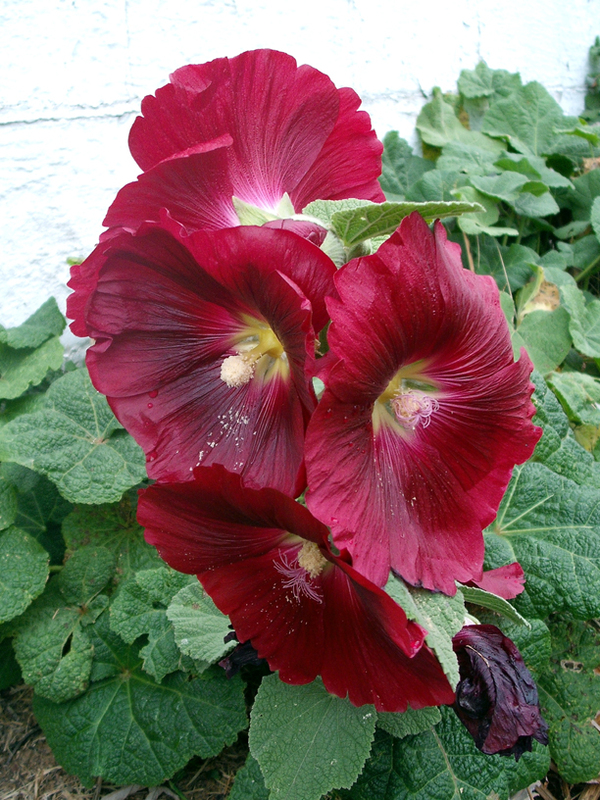 This little hollyhock has been a blessing to me as this time of year my eyes begin to feel starved for color. I’ve never had one bloom this late (in spite of several light frosts). It turned out to be a particularly fine specimen, with unusually large blooms and striking color. I will definitely save seed from this one and hope it returns true. There are certainly no others for it to cross-pollinate with!